Over the past 10 years The Mulka Project’s Yolŋu-owned and governed digital archives have grown to contain over 35 days of audio recordings, 9 days of film, and over 80,000 images. 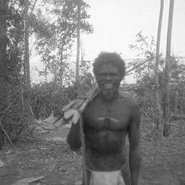 This archive contains material from the 1920s to present day and spans seven generations of Yolŋu. The material within these archives, in particular the photographic archive, is structured in relation to family connections or gurrutu. Ordering an archive in what ostensibly amounts to a giant family album may seem parochial. However, it is through this one piece of metadata that the knowledge of previous generations is accessed by the individuals it most pertains to. In this lecture, The Mulka Project’s Ishmael Marika and Joseph Brady will demonstrate how this idea has had a profound impact within the community and in external organisations, and how it helped solve an 80 year old mystery within The University of Melbourne’s archives. This mystery directly relates to Noŋgirrŋa Marawili’s family and brings to light perhaps the earliest moving footage ever recorded in Arnhem Land. Image: Mundukul, father of the artist Noŋgirriŋa Marawili, at Gaṉdiwuy July 1935. Image from The Mulka Project archives and courtesy of The Thomson Family.